The SAMINA sleep system includes from top to bottom, a climate-regulating wool pad topper; supplementary Lokosana® grounding pad; a latex mattress; and an orthopedic flexible slat frame. Additionally, SAMINA offers complementary orthopedic pillows and duvets filled with natural, bioactive materials for a complete sleep solution. Incorporating what we now know we need to support your body for a good night’s sleep and to do so naturally, the SAMINA healthy sleep system is the ideal organic mattress solution. When compared to the body, you will understand just how inadequate a single layer (or mattress) is for supporting its needs. SAMINA brings nature back to bed for sleep in its most natural form. Like the human body, the SAMINA healthy sleep system is built of layers that work in harmony with the body. Thanks to its layered components, the essential conditions are present to fall asleep relaxed, stay asleep and awake refreshed. These layers are described in detail below. The SAMINA sheep’s wool mattress topper forms the uppermost layer of the SAMINA sleeping system. It is filled with 100% virgin sheep’s wool which, in addition to a high rate of moisture absorption, also has an ideal self-cleaning capability. Thus, the moisture which is sustenance for allergy-causing dust mites is eliminated. The dry heat allows for a good night’s sleep and also has anti-rheumatic benefits lessening the occurrence of a stiff back or neck. The shell of the virgin sheep’s wool mattress topper comes in options made from either organic cotton or Bio-ceramic® organic cotton. As human beings, we are bioelectrical organisms living on an electrical planet. The basic idea of the Lokosana® grounding pad is to improve the quality of sleep through grounding (also known as “earthing”) and the desired stabilization of natural magnetic fields. Grounding Scientific studies have shown that when we ground ourselves, free electrons in our body flow more freely. Thus, the body can use the electromagnetic quality of the earth for a better and deeper sleep. People say that sleeping while grounded improves circulation, lessens pain, they awaken feeling better and with more energy. Most people feel comfortable in the great outdoors especially when they are barefoot and that’s because they have direct contact with the earth – they are physically grounded. The Lokosana® grounding pad is a revolutionary way for you to have healthy, restful sleep. With Lokosana, you can have the “barefoot in nature effect” throughout the night. As part of the SAMINA healthy sleep system, you would place the grounding pad on top of the natural latex mattress and then layer the wool pad topper on top of it. 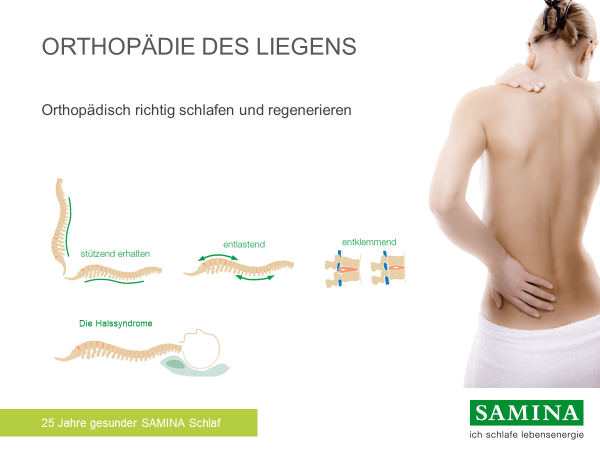 The natural rubber mattress by SAMINA efficiently transfers the action and properties of the flexible slat frame so the sleeper continues to have support from head to toe and especially along each spinal vertebra. It is characterized by particularly superior elasticity and exceptionally good resilience to assure a high level of comfort while sleeping. Ever experience the annoyance of a mattress sagging in the middle? Thanks to its porous cellular structure, the SAMINA natural rubber mattress ensures springiness without sagging and is great for optimal moisture regulation, too. Furthermore, using the purest organic rubber without additional chemicals, the rubber is naturally anti-microbial and the deficiency of moisture in the bed helps ensure no mold, mildew, or bacteria growth. This low-maintenance, light weight, and durable mattress is an integral component of the SAMINA healthy sleep system. To ensure complete relaxation, optimal recovery and less stress on the back, the spine and muscles, the ideal sleeping base must support the body while lying down just as if it was standing up. Most people will notice the signature double-S shape of their spine when standing in a mirror. Yet often when people lie down, they lose this shape. SAMINA’s flexible slats help retain the natural spine shape and it is noticeably more comfortable, supportive enabling the body better to relax and therefore experience deeper sleep. The SAMINA healthy sleep concept fulfills this spinal shape criterion perfectly thanks to the patented construction of the double-sided, free-floating SAMINA slats. The slats support and relieve the body to ensure a constant pressure between the sleeper and the bed. While sleeping, you experience a long-term traction of the spine, the intervertebral discs have more space and can regenerate properly, and the muscles are able to let go in all sleeping positions and relax. The SAMINA slats interact with the sleeper in a supportive, springy and balanced way – irrespective of body weight. What’s more, the unique design of SAMINA will always include a pair of slats per queen or king size bed; one set of slats per sleeper for individual, customized support. The slats may also be adjusted in a few different ways for a truly custom sleep experience. The orthopedic slats are an integral part of the SAMINA healthy sleep system because they provide such thorough back support while virtually eliminating pressure points, tense muscles and numbness from poor circulation. SAMINA also offers a series of sophisticated accessories such as the Reading Recliner that enables a gentle support of the spine while seated; hip booster inserts (for people with curvier shapes); and shoulder bolsters (especially good for side-sleepers with broad shoulders). These optional accessories and other adjustments are best determined in consultation with a SAMINA healthy sleep advisor. NOTE: These optional accessories and other adjustments are best determined in consultation with a SAMINA adviser.